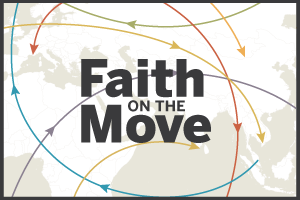 While a majority of Jewish migrants have come from Europe, more than three-quarters of those alive today have moved to the Middle East-North Africa region, almost entirely to Israel. In terms of individual countries, Russia has been the largest source of living Jewish migrants (more than 700,000), followed by Ukraine (about 300,000). 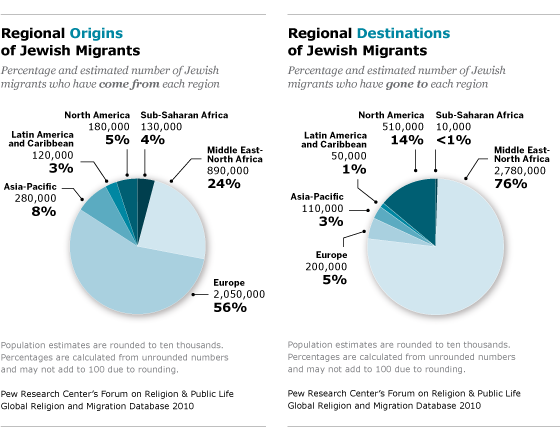 Many of the other top countries of origin for Jewish migrants – Morocco, Romania, Poland, Iraq and Iran – once contained thriving Jewish communities that today, in some cases, are relatively small. 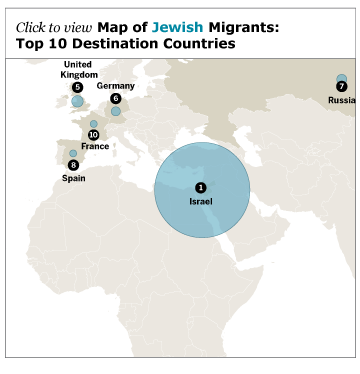 A substantial majority of Jewish migrants (nearly 3 million) have ended up in Israel. These migrants have come from all over the world, but mostly from Europe, particularly Russia. Other countries with large first-generation (foreign-born) Jewish immigrant populations include the United States (almost 400,000), Canada (about 140,000) and Australia (about 70,000).